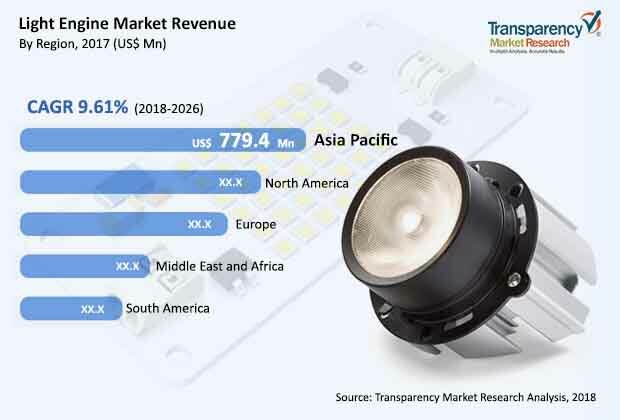 The global market for light engine is significantly growing with the increasing partnership among various players in the market, as per the analysis done by Transparency Market Research (TMR). The increasing popularity of light emitting diode (LED) and its wide adoption is the major factor boosting the light engine market. The use of LED reduces that cost and energy, which is not the case with conventional lighting systems, is increasing the demand for light engine market. The major players in the market are making are using various marketing strategies, carrying out mergers and acquisitions, and building partnerships that will definitely enhance the light engine market at an international level. Some of the key players in the light engine market include General Electric Company, Philips Lighting Holdings B.V., Thomas Research Products, OSRAM Licht Group, Fulham Co. Inc., Tridonic, Fusion Optix, Inc., RS Components Pty Ltd., Cree Inc., and MaxLite Inc. According to the TMR analysis, the global light engine market is projected to expand at 9.61% CAGR during the forecast period from 2018 to 2026. The valuation during this period is estimated to increase from US$ 2.53 bn in 2016. Under the application category, commercial segment is expected to lead the market with increased percentage of CAGR. Moreover, increasing adoption of linear light engine as a form of LED lighting in most of the households will boost the market in coming years. Geographically, North America leads the market with higher adoption of LED lights with improved technology. Moreover, having large number of players adding innovative solutions for light engine will further boost the market in this region. The adoption of LED lights have increased massively at international level and majorly in the emerging economies. The use of flexible light engines is highly seen in residential and commercial areas that will significantly boost the market for light engine during the forecast period. Moreover, rigid light engine are also highly used in horticulture and in automotive industries. LEDs are also used in streetlights, which will also certainly boost the demand for light engine market. Favorable government regulations will further fuel the global market for light engine during the forecast tenure. Additionally, government of emerging economies mainly in India, China and Japan are making constant efforts and encouraging its people to use more of LEDs lightings on regular bases. In 2017, Street Light National Program initiated by Indian government, in which they installed approx. twenty-one lakh LED lights across nation. Thus, initiatives like this will trigger the demand to use LED light and significantly boost the market for light engine market globally. There are certain restrains that diminishes the growth of light engine market such as LED lights experience mechanical failure or its performance reduces when there is a rise in temperature. This is a concerning factor as and when the demand for LED lights decrease it will immediately affect the demand for light engine market. The U.S. American Medical Association (AMA) in 2016 has issued concerns related to the harmful effects of blue light used in high color temperature (CT). Although they did suggest that lower blue light content will indirectly help in improving the global market for light engine in coming years.